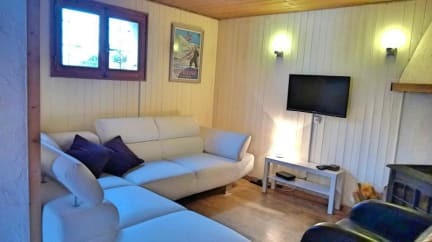 Chalet D'amo is located 2km from the centre of Morzine, a picturesque mix of old traditional village and modern ski resort, the chalet is surrounded by mountains and forests. 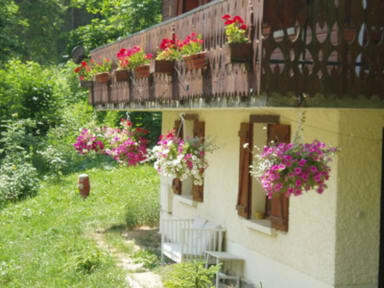 It is a traditional alpine lodge with accommodation set over 3 floors to accommodate up to 13 guests. Refurbished in September 2004 to include 3 ensuite bedrooms, the chalet has new wooden flooring on the ground floor and carpeting in the bedrooms. All bathrooms are new with stylish fittings and tiled flooring. The chalet has copious hot water from 4 electric water tanks and has thermostatically controlled heaters in each room. On the ground floor there is a large dining room seating 12 - 13 around a large communal table. The lounge area has a wood burner which keeps it cosy in winter and summer and a TV with satellite channels, DVD and CD player as well as a good selection of board games for entertainment. Outside there is a large secluded garden with views of pasture, mountains and forests. In the summer there is a barbeque area with table, sun loungers and hammocks. The chalet is non smoking. Accommodation in Chalet D'Amo is available on Bed and Breakfast or Half Board options or you can mix and match. Entrance with ski boot store. Open plan dining area and cosy lounge with wood burning stove and TV/ DVD/ CD player. There is an honour bar area with beers/wine and soft drinks and complimentary tea and coffee. The dining area seats 12-14 people on a large farmhouse table. Room 1: A large bedroom with twin beds with ensuite shower/WC with access to balcony (this room can also take another bed to sleep 3). Room 2: Twin room with ensuite shower/WC. Room 3: Twin room with ensuite shower/WC. Room 5/6: A large suite of rooms suitable for families or a group of four/five with double bed (can also take another bed to sleep 3) and adjoining twin bedroom. This room has a balcony with views of the mountains and forests. These rooms all share a large shower room/WC. There is a separate WC on this floor. A lively French village with a cosmopolitan feel.